Before the middle of the 30s of the last century, the Japanese tried to actively copy American samples and technologies available in the country. The Japanese automobile industry is, of course, Toyota. But the company, existing since 1890, before 1936 produced weaving looms. The less pretentious Nissan came into the world in 1936. Honda is 12 years younger. The first Mazda rolled off the production line in 1940 and Suzuki ceased to churn out looms only in 1952. Perhaps Isuzu, who already in 1916 sought to organize production of Japanese cars, became the true pioneer in the Japanese car market. Essentially, the Japanese automotive industry was born on the 26th of June, 1950 – on the day of the beginning of the war in Korea. The Ministry of external industry and foreign trade of Japan prepared recommendations on development of the Japanese automobile industry for that time, and in the first 8 months of the war, the USA bought 11,920 cars in Japan. At one moment, Toyota, Nissan, and Isuzu joined the ranks of a number of leading companies in the country. In 1970, Japan sent for export 726,000 units from 3,179,000 cars manufactured in the country. In 1974, Japan, with its Toyota, Nissan, Honda, and Mitsubishi outscored in the volume of export of cars in the country, No 1 in this field – Germany, unwavering before that with Mercedes, Audi and Volkswagen. This situation did not change still. In the middle of the 80s, “Nissan-Sunny” was one of the most popular models. Today, motor vehicle manufacturing in Japan decreased, which occurred because of a very firm Yen and the tough rivalry against the USA. Toyota is considered one of the best Japanese car makers in the world. Toyota`s cars are of high quality and safety. Lexus is Toyota`s counterpart of Nissan`s Infinity. From the first emerging of the L400 in 1989, Lexus proved able to overcome the performance of Honda’s Acura in America. Suzuki is well-known for different models of motorcycles. However, it is also the carmaker, which was able to get the tenth rank between car manufactures from all over the world in the 2011. Besides cars and motorcycles, Suzuki produces ATVs and outboard marine engines in 23 countries. Mazda is a significant player in the world auto market, which produces its cars using its national industrial capacities. From 1979 to 2010, the Japanese carmaker collaborated with Ford. Together they evolved such divisions as the Autozam, the Efini, the Eunos, and the Xedos. Japanese car names like Mazda are also present in the sport car category. Honda started the production of cars only from 1969, as motorcycles were its initial models. Now, Honda has about twenty models in assembly. Accord and the CR-V SUV are the most renowned ones. Acura is a separate division of Honda. Though it was established only in 1986, its models are sold massively, predominantly overseas. Mitsubishi Group is a giant auto manufacturer, which collaborated with Daimler-Chrysler in the 2000s, due to the overwhelming impact of the financial crises. Its models, such as the Lancer or the Outlander, put the Mitsubishi name among important auto producers. Well-known Pajero is now one of the world’s most acknowledged SUVs. Part of the Renault-Nissan alliance, Nissan is between the world’s top carmakers with vehicles commercialized all over the world. Its main markets are in China and Russia, thanks to consolidations with the Dongfeng Motor Corporation and Russian Technologies. Nissan is an innovative manufacturer, showing interest for electric vehicles and for luxury car models. Infiniti is a top-range branch of Nissan. It began to sell its cars in the USA, and within the next twenty years, it conquered markets in about 15 countries. Subaru is the car-producing branch of the company, Fuji Heavy Industries. It is well-known for introducing the boxer engine placement and symmetrical all-wheel drive technology. Subaru manufactures rally cars and turbo versions of popular passenger cars. Daihatsu Kogyo Co. Ltd. is a subsidiary of the company Toyota specialized in motor vehicle manufacturing. The company’s name is the abbreviation of two hieroglyphs. The first part of the abbreviation comes from the name of the city Osaka, where the company Hatsudoki Seizo Co., Ltd, which was engaged in the production of car engines on the base of the Osaka University and the activity of which lasted during 20 years, was situated. The second part represents a combination of the hieroglyphs meaning “production of engines”. The Daihatsu emblem looks very laconic as the slogan by the company: “We make it compact”. There is a stylized element in form of the letter “D”. Its cars are delivered to more than 100 countries of the world. 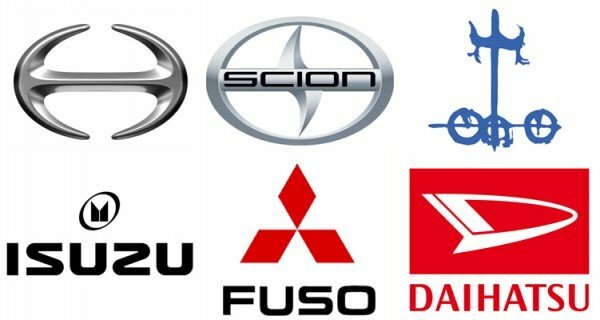 The trade mark Fuso belongs to the German car concern Daimler, which owns a larger share of the company’s stock (about 90%) and to the company Mitsubishi. Fuso buses and trucks have been produced since the end of the 1920s. The Fuso line includes vans and chassis for Fuso Canter. The company Isuzu started its existence in 1889. Then its name sounded as Tokyo Ishikawajima Shipbuilding & Engineering Co., Ltd. This is one of the first companies which began to use diesel engines in motor vehicle manufacturing. The company produced its first car in 1916. The company started to produce its commercial cars in 1922, together with British car company Wolseley Motor Ltd. In 1949, the company was renamed Isuzu Motors Limited. It was named after the Japanese river Isuzu. The Isuzu emblem looks simple enough. Its initial letter is stylized; it is a symbol of growth. Red color of the emblem corresponds to the insignia of the Land of the Rising Sun. The company Mitsuoka has a reputation of the most original Japanese carmaker. Susumu Mitsuoka founded the company in 1968. Originally, the make was engaged only in car repairs and pre-sale preparation, but in a short run of time, it managed to become a rather known carmaker. The Mitsuoka emblem is well recognized by motorists all over the world: the white figure “eight” and star inside a circle is depicted against the blue background of the logo. The company belongs to the car concern Toyota. It produces cars only for North America. All the cars of the make Scion are available only in a single configuration. However, such concepts as SCION FUSE and SCION T2B are also offered. The company emblem was created in California. The stylized letter “S” is depicted on it; it symbolizes a swimming shark, which unites the logo with lovers of extreme sports, especially related to the ocean. The company name is translated as “heir”. In 1942, the company Hino Heavy Industry Co., Ltd was separated from the company Diesel Motor Industry Co. Thus, the company Hino appeared. After the end of the Second World War, Hino Heavy Industry removed the word “Heavy” from its name and concentrated its efforts on the production of trucks, buses, and diesel engines. In 1948, the company added the word “Diesel” to its name. The make belongs to the concern Toyota. It is one of the leading Japanese truck manufacturers.